The roaring beat of Sri Lankan temple drums opened the day with a bang. They were followed in procession by the monastic Sangha walking mindfully, led by Dharmacharya Ian to their places next to the podium. The two beautiful MC’s, Liz and Queenie, from Pine Gate and the Vietnam Temple, guided the overflowing audience through a day of utter astonishment. From the monastic chanting all the way through to the finale – the day unfolded in a majestic way. 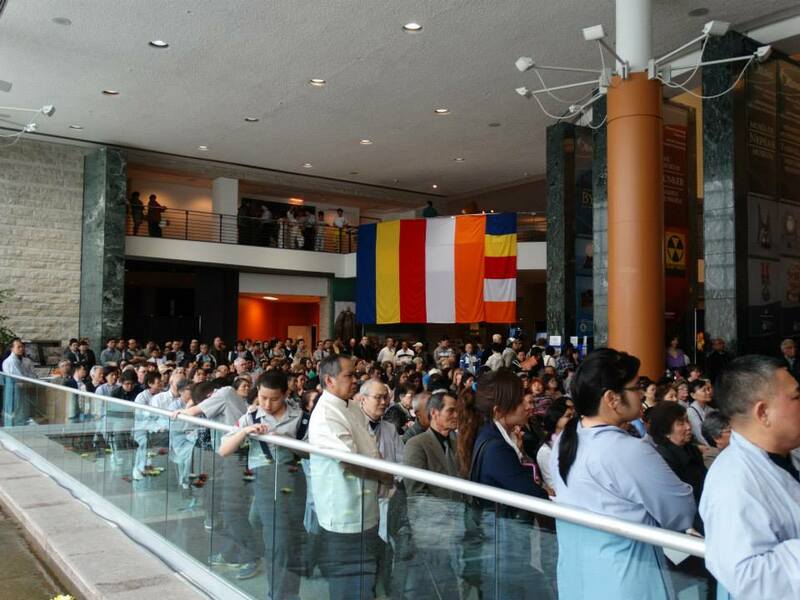 Ottawa City Hall was decorated with beautiful artwork, food tables and booths for Asian embassies and other community groups for this first-time joint celebration of Vesak Day. It was a stunning day. 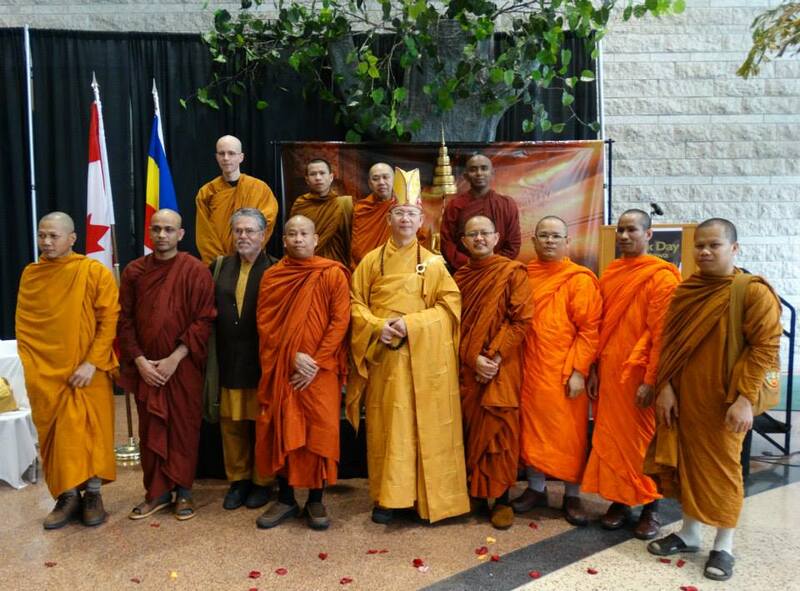 Pine Gate Mindfulness Community and Asian Buddhist communities in Ottawa – from Cambodia, Vietnam, Korea, Indonesia, Laos, Sri Lanka, Taiwan and Thailand – created this Vesak Celebration. The 2014 Vesak Festival received guidance from three spiritual advisors – Master Bon Dat, Bhante Rath Sam and Dharmacharya Ian Prattis. They each came from different Buddhist traditions in Ottawa and three different countries – Vietnam, Cambodia, Canada. They established a common cause to spread the seeds of Buddha Mind across Ottawa by creating an atmosphere of generosity, humility and kindness. Organization meetings were held during the winter months in the various temples in the city and at Pine Gate. Our MC’s announced the Vesak and Asian Heritage nature of the event before introducing messages from the Governor-General, Prime Minister of Canada, Premier of Ontario and the Mayor of Ottawa. This was wonderful support for multi-culturalism and interbeing from all levels of government in Canada. They fully endorsed this Vesak Day initiative, which was new to Ottawa and indeed new to Canada. Donations taken in on Vesak Day ($900) supported the education of young boys and girls in Cambodian orphanages. Education was seen as a vital antidote to the trafficking of children in that country. The Thai ambassador, Pisan Manawapat, gave a speech about the importance of Buddhism in his country and in Canada. Dharmacharya Ian gave the inspirational speech on Cyberbullying and Buddhist practice. The program continued with cultural performances from the Thai Dance Troupe, the Vietnamese hat dance performed by four delightful girls, and the graceful Happy Dance from Chinese seniors. Then it was time for a vigorous Lion Dance from the Vietnamese Youth Group to close the day. Folk remained to take food, visit and mingle. Connections were made, bridges were crossed and organizers, volunteers and the audience packed in to City Hall went home very happy. Confidence that Buddha mind was working well. Background about Vesak and the Buddha. Buddhism is a religion based on the teachings of Siddhartha Gautama, the Buddha, who lived and taught in India ca. 2,600 years ago. 550 million people in the world identify Buddhism as their religion or way of life. Vesākha Day is the day Buddhists remember the birth, the enlightenment, and the passing away of the Buddha. The United Nations marks Vesākha Day as an official holiday, worldwide. As Buddhism spread from India, it was adapted to many cultures, and consequently Vesākha Day is celebrated in many different ways in various countries, such as China, Japan, South Korea, Indonesia, Sri Lanka, Vietnam, Burma, Tibet, Bhutan, Thailand, and Nepal, the birthplace of Siddhartha Gautama. Some will visit their local temple before dawn, to raise the official Buddhist flag, which represents a rainbow. Some may bring simple offerings of flowers, candles and incense, which serve as a reminder that just as the beautiful flowers will wither, and the candles burn out, so too is life subject to impermanence. In some countries, birds and animals are released in a symbolic act of liberation. Vesākha Day is therefore a time when we reach out across the various Buddhist traditions to celebrate, and to non-Buddhists to enjoy dialogue and harmony. And that is exactly what took place in Ottawa City Hall on May 4, 2014! Glad you enjoyed it Gary.